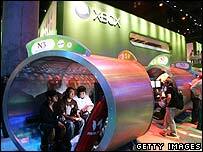 Last year's E3 gaming exhibition in Los Angeles promised an all-out console war between Microsoft, Sony and Nintendo. But it never happened. This year the big three held spectacular press events again - but is it for real? The biggest crowds and fastest legs all led to Nintendo's wrap-around booth which kept its Wii device hidden to heighten anticipation. Those who waited hours got their hands on the new-style controllers which make gameplay easy. As Nintendo's David Yarnton said: "With the tennis it's so intuitive that you can actually do top spin with it, so it's not just lateral movement." Earlier in the week the big three invited journalists to find out what a difference a year makes. Nintendo had a lot to prove. Last year PS3 and Xbox 360's next generation graphics made the company look weak. 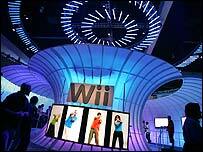 But even without HD capability the Wii could become a huge hit with those who do not fit the traditional gamer profile. So much for Nintendo, but what about the two bigger players in the console game? At last year's E3 the post press event perception was that PS3 was on top with Xbox 360 at number two. This year there has been a switch. "The press conferences are all about flash and glitz", says Tal Blevins from IGN.com. "You have to get it out there, you have to impress people. "You don't want to have just a PowerPoint slide, which Sony kind of bored everyone with this year. Microsoft just came out with a spectacular presentation." Microsoft peppered its press event with lavish gameplay that the audience lapped up from their seats, and later on the convention floor. David Hufford, Xbox Group product manager, said: "It was very important to show people the kind of significant leap you're going to see in the second generation of Xbox games. "Titles like Gears of War, Fable, the next generation of Fifa and Madden, all those titles are here on the floor, and what people are doing is walking up and realising that we're leading the way." Bill Gates made his first E3 appearance, but with the Xbox 360 already in shops, the audience wanted - and got - big game announcements, including the biggest of them all, Halo 3. Obviously we are not going to know who really comes out on top until at least next year, but game manufacturers are already signing non-exclusive deals. Every time Microsoft, Sony or Nintendo signs up an exclusive title, the more desirable their console becomes to fans of those games. Meanwhile Sony's biggest announcement was a new PS3 lightweight wireless controller with motion sensing gyroscopes. It was not enough to wow the crowd as PS3 gets ready to launch this holiday season, but at the same time Sony cannot be underestimated. 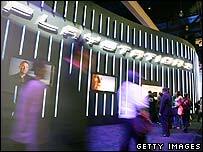 Ryan Bowling, from Sony Computer Entertainment, said: "When we introduced the PS1 we were the underdog. You had Nintendo and Sega thriving, but we were able to come out on top with the PS1. "PS2 launched in 2000, the Sega Dreamcast was out but we came out on top again. So we're not directed by the competition." So the waiting game begins. Even at launch, Sony will have very few consoles available, while Microsoft will ramp up production. And Nintendo will be hovering above, ready to pick off first-time gamers, and players disillusioned with high prices and complex controllers. Which console would you choose?